Rainbow everything has been taking over food-centric Instagram of late. Whether you crave a rainbow doughnut or a rainbow latte, it’s out there – and now, of no surprise to anyone, you can also enjoy a rainbow burger. 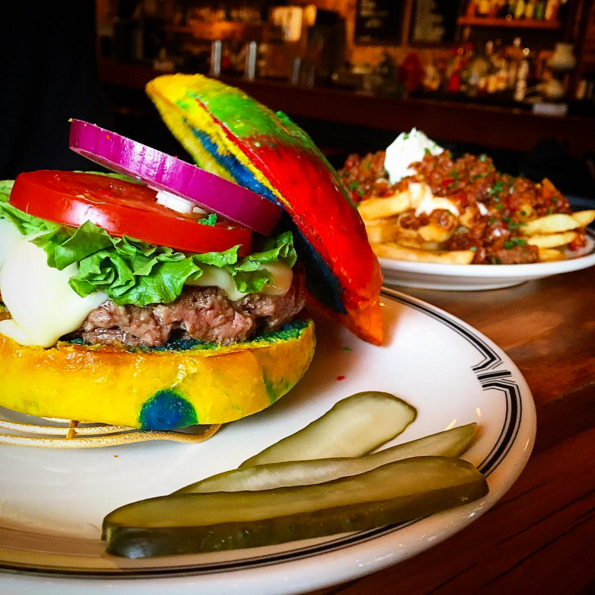 The rainbow burger is available for a limited time only at Joe’s Bar in New York City, as part of Burger Week. A burger can already be something of a rainbow if you choose the right array of condiments, but this imaginative Willy Wonka-themed creation brings the concept to a new level. The burger, made of Schweid & Sons premium ground beef, is served on a Technicolor rainbow bun from NY Handmade Breads and served with ‘Grandpa Joe's French Fries’, made sloppy Joe-style. Much like the golden ticket of Willy Wonka legend, one lucky diner will find a ‘golden lift’ – a steel device that lifts the burger up and away from its juices, securing that rainbow bun stays dry – that entitles them to an open bar for 20. Nothing washes down a rainbow burger like lots of free beer.